You start off the story knowing almost nothing about the characters. You are Wander, a warrior who recently lost his beloved, Mono, and isn’t willing to cope with her passing. He brings her to The Shrine of Worship, a place located in a forbidden part of the world. Upon placing Mono on the pedestal, several shadows appear, which then dissipate when Wander takes out the ancient sword and shines a light on them. Noticing this, a god named Dormin begins speaking to Wander, impressed that he has this sword. Wander asks Dormin if Mono could be brought back to life, telling Them (yes Them) that she was sacrificed for supposedly having a cursed fate. Dormin reminds him that the law of mortals dictates that the dead cannot be brought back; to disturb this natural order would have its consequences. Wander doesn’t care, he just wants Mono back and would do anything for it. 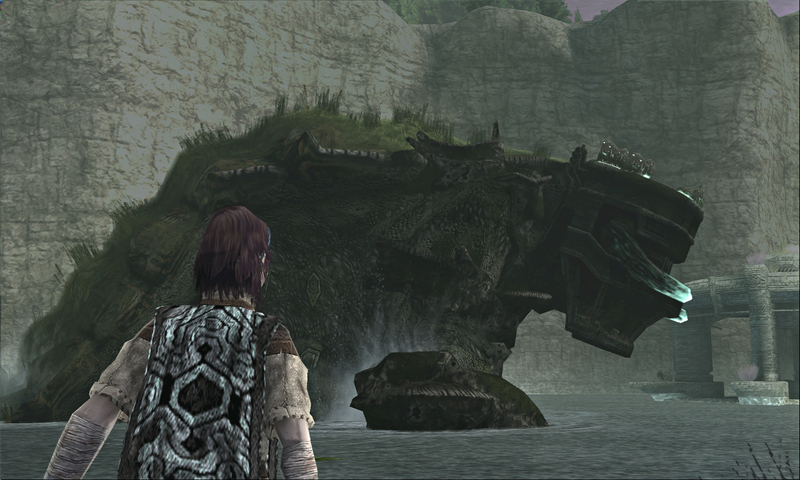 Like ICO, Shadow of the Colossus exhibits a minimalist tone in its design. The Forbidden Land is barren of any life, save for birds, lizards, and the colossi themselves. While there isn’t much to talk about when it comes to environmental variety, it is interesting to see how exactly some of land transitions into another type of setting, like going from plains to desert, or forest to lake bed. 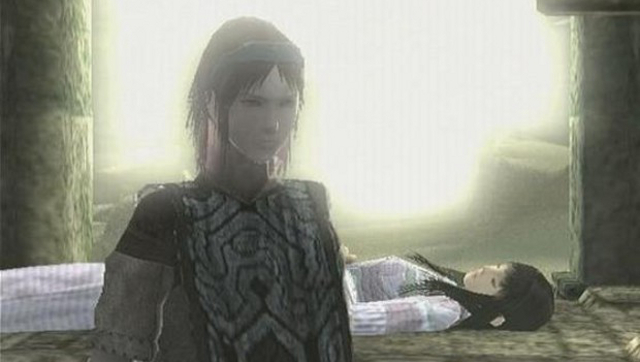 What’s more fascinating is the sort of visual stories some of the colossi arenas tell. “What was the purpose of this shrine which this colossus guards? What was that platform above the lake for? Did people live in this citadel?” Of course, none of these questions are really answered. The real technical marvels are the Colossi themselves. 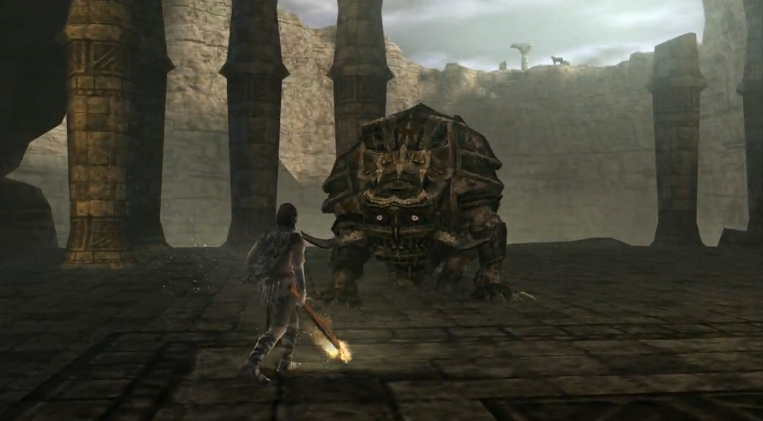 While enemies this large appeared in other games before this one, none were as interactive or involved as the ones here. While they are the only enemies in the game, you’ll face each one long enough to sort of appreciate their craft and scale. Looking back at this game, it’s amazing when you remember this game came out in 2005. 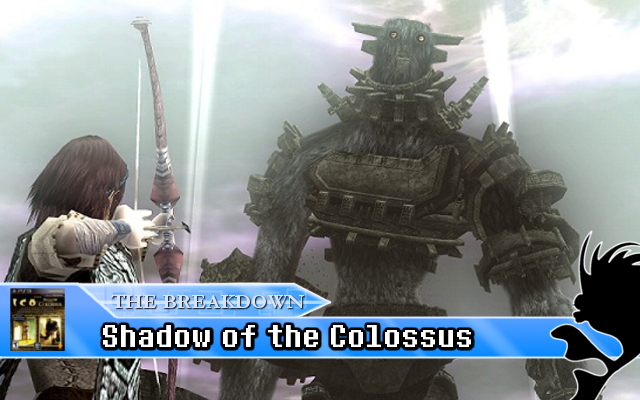 Music in this game is used sparingly, left only for colossi fights and cutscenes. In between these, all you’ll hear are howling winds, the galloping of your horse, Wander as he whips the reigns, rushing water, and hawks flying by. All this together really immerses you into this empty world. It’s almost jarring to hear such silence, but only furthers the mystery of what the Forbidden Land hides. This is one part the game that could be either love or hate for any reason. Those looking for something to fight in between the colossi fights won’t be fighting anything else be these. Sure you can hunt those shining lizards for more grip strength, but that’s about it. I never really found a problem with this, especially considering that you’ll be fighting the colossi for upwards to 15 minutes to a full hour.The first part of the colossi slaying is actually finding one. You’ll be told by Dormin who “Thy next foe is” and where it’s located. You then have to raise the sword and go to where the lights all converge via horseback. Controlling your horse is like controlling a car, you hold down one button and press left for left, right for right, and back to stop. It can become somewhat of a pain to get Agro, your horse, out of a corner, which is further exacerbated in more scrunched areas like some narrow pathways and wooded areas. Thankfully Agro goes into a sort of auto-pilot when crossing bridges (you still have to hold down the X button though). On the colossus fighting side, the Grip Mechanic is your bread and butter to climbing a colossus and staying on it. If something is furry or has a ledge to it, you can grab it. The grip mechanic most certainly adds challenge as you’ll be planning out your path and where you might be able to restore more grip strength while on a colossus. 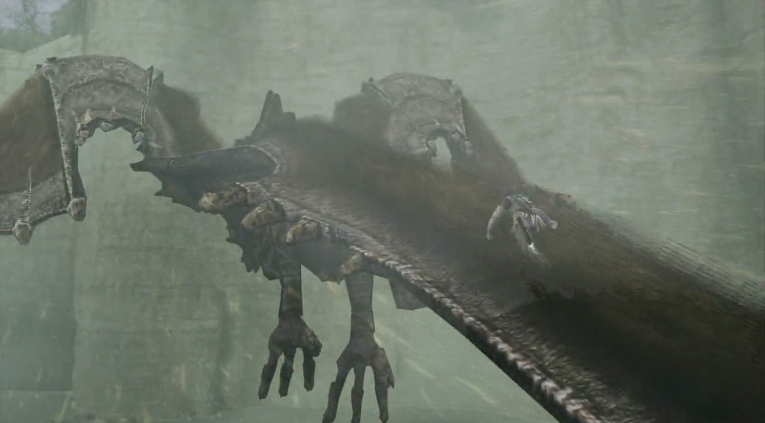 The colossi will make every effort to get you off them, whether it’s by shaking themselves, flying upside down, or swimming lower underwater. No matter how violently they maneuver, if you have grip strength left, you’ll hold on. Rest assured, you will be frustrated when fighting a colossus, You’ll be ready for a stab, only to be shaken out of position and wait them to stop so you can start again. However, the frustration only adds to the satisfaction of taking down something that’s big enough to be a skyscraper. Breaking the trend of usual game design, Team Ico tried something that no one thought would be possible, and was probably only a norm in those multi-limb boss fights in RPGs. A little man toppling titans, a constant David and Goliath moment, all as a means to defy the natural order of man to revive a fallen loved one. The environment is barren of life, but heightens the sense of mystery of what the Forbidden Land may have had eons ago. The music is only heightens the feeling of awe as silence accompanies your trek to the next fight, and opens with a thunderous torrent of percussion and sweeping strings. This synergy of silence and action continues with the gameplay as calmly mare your way to the next arena tense up with each fight. The daunting task of felling a giant begins to unravel as you discover its weakness and begin the ascension for its decension. 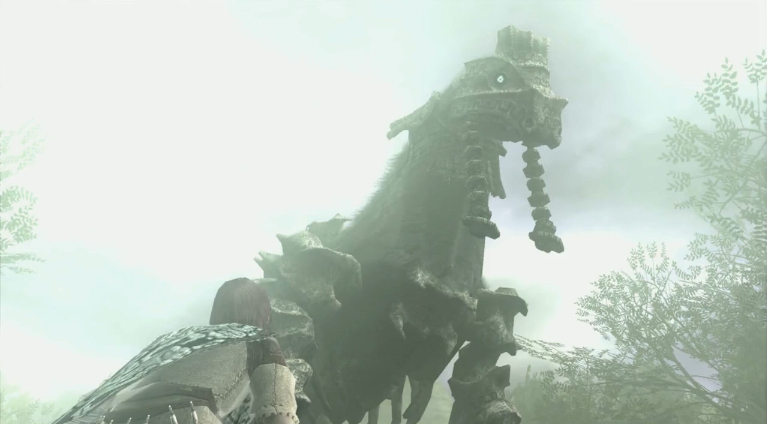 Shadow of the Colossus is an artfully crafted experience that shatters what “good art” is in videogames. It’s a masterpiece.